RS 660’s engine is built on the litre-class RSV4 architecture. 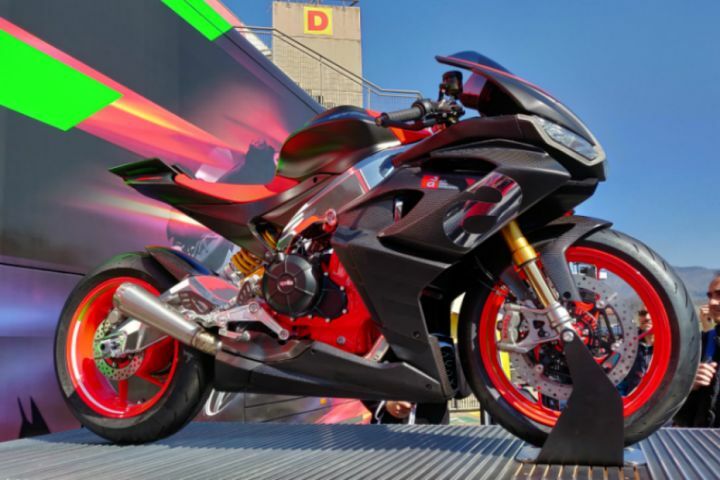 First Aprilia motorcycle to feature active aerodynamics. Will get top-spec components like Ohlins suspension, Brembo monoblocs and Pirelli rubber. At the recently concluded Aprilia All Stars event held at Mugello, Aprilia had a special section dedicated to all of its road-biased offerings. Here, attendees could get a small feel of all the motorcycles barring one that was put on a pedestal above others. Yes, the Italian bikemaker showcased the RS 660 once again. Now news emerging from a French publication has delighted those of us who want this mid-spec Aprilia RS supersport as it will be a model year 2020 motorcycle. It would not be fair to say that the RS 660 is just an engine-hack job version of the larger RSV4 1100 Factory (which we rode recently at Mugello, ride report coming soon on ZigWheels.com). Sure, it gets its motor from the front bank of cylinders from the RSV4’s 1078cc V4 motor. It may also look like a smaller and evolved version of the RSV4. However, there is more to it than what meets the eye. Firstly, the fairing might look similar but it is made completely out of carbon fibre. What is more special is that it will be the first motorcycle to feature Aprilia Active Aerodynamics. Aprilia wanted to make something that need not adhere to any racing regulations with the sole intention of making it a fun to ride motorcycle. The way the air travels through the motorcycle enables it to create maximum downforce so as to allow higher corner speeds but not offer too much drag resistance in a straight line. This system is expected to make its way onto the next-gen RSV4 that is set to launch in 2021. Two test mules of the RS 660 were spotted testing at the Vallelunga circuit earlier this year. One of them was seen sans any mirrors as well as a tail-tidy and lighting system that are necessary for road-legalisation. Perhaps this could be a race version which Aprilia might use to participate in the Lightweight TT class of the Isle of Man TT. This supertwin is likely to get the full Aprilia electronics APRC suite found on the RSV4. Plus, an all new aluminium frame and an aluminium swingarm will definitely make for lightweight foundations. The carbon fibre rear sub-frame will also help in this regard and it might also get a lithium ion battery like the new RSV4 1100 Factory. It gets its fair share of top-spec components like TIN-coated Ohlins NIX fully-adjustable USDs, Ohlins TTX rear-shock, Brembo M50 monobloc calipers and Pirelli Diablo Rosso II rubber. Aprilia wants to nail the pricing for not just Europe but also for Asian and North American markets as well. This means we could see this lightweight superbike arriving on our shores around late-2020. Asking price? The Kawasaki Ninja ZX-6R retails for Rs 10.49 lakh. Given that this Aprilia is technologically superior and is likely to arrive as a CBU, we could expect it to be priced around Rs 14 lakh (ex-showroom). Share your experiences with RSV4? 2013 Aprilia RSV4 Factory ABS: In Pictures! A New RSV4 Brewing In The Aprilia Labs?